Andy Palacio was a popular Belizean musician who was born on December 2, 1960 in the village of Barranco in Belize, Central America. Palacio is the most famous musician to emerge from this little-known country. His work has influenced musicians and music-lovers all over the world. Palacio was a Punta musician from the 1980s to the early 2000s. Punta is a genre of dancing music originated in the Garifuna culture, which is played during local celebrations and social events. It can be sung in Spanish, English, or Belizean Creole, but is most often sung in Garifuna. Palacio’s style of Punta is known as Punta Rock, in which the traditional sounds of Punta (a blend of Carib sounds with West African beats) are incorporated with the American sounds of Jazz and Rock & Roll. Andy Palacio worked with a diverse range of musicians and producers that helped influence his unique, creative sound. His 1995 album Keimoun (Beat On) used Cuban and Belizean musicians, and earned him wide recognition all over Latin America. The success of his album helped pave the way for other Punta artists to appeal to an audience beyond the Garifuna. Palacio’s success allowed him to travel the world, and in exchange brought global attention to the Garifuna culture. He also became a spokesman for the Garifuna people. During a time when tourism and Americanization were increasingly influential in Belize, Palacio became a vocal public advocate for the need to preserve the dying Garifuna culture. Because of that advocacy, he was named as a Cultural Ambassador for the country of Belize. Palacio’s last and most popular album, Watina, was released in March 2007. 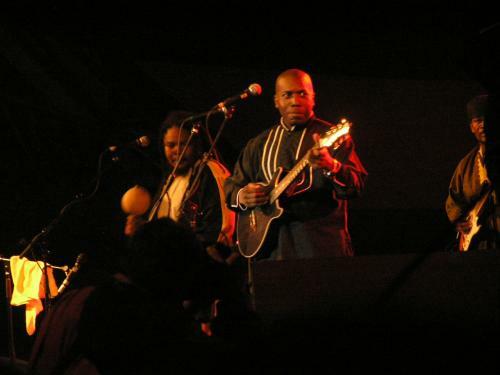 It featured various other Garifuna musicians, and was recorded with the Garifuna Collective, a group of Garifuna musicians who traveled the world and sang socially-conscious songs. He was the most popular musician among Belizeans but he was also well-known in neighboring countries such as Honduras, Guatemala, and Mexico. On January 17, 2008, Andy Palacio died of a massive stroke and heart attack just after his 47th birthday in San Ignacio, Belize, leaving a rich legacy of ethnic and national pride by creating and opportunity for Garifuna artists to have their music and culture showcased and respected beyond Belize. The Belizean and global community were shocked and stunned at Palacio’s sudden death, but his music is remembered culturally transcendent.